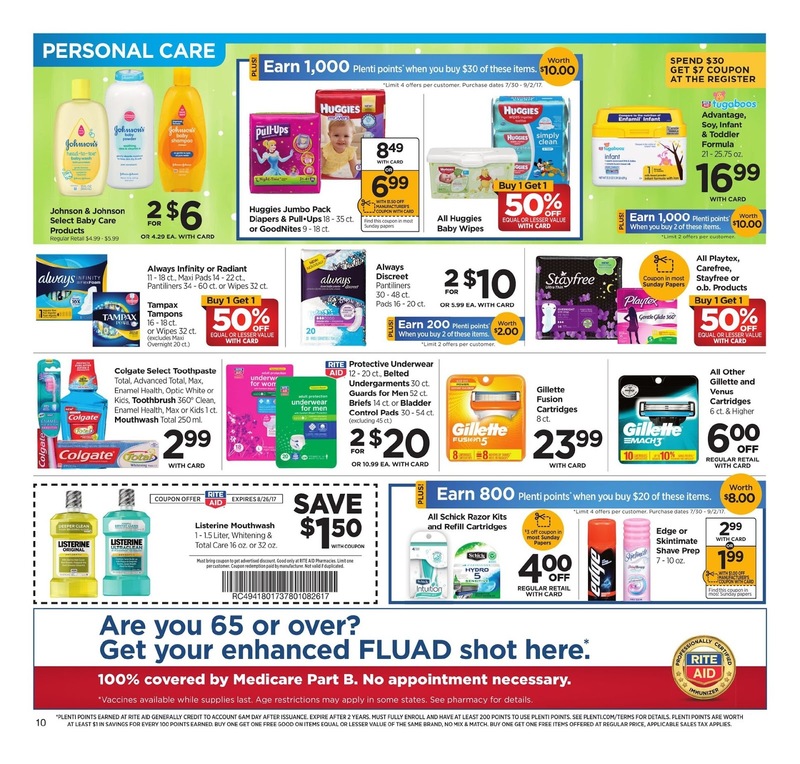 Rite Aid weekly ad this week offers Beauty products including Irish spring 6 or 8 bar signature 3 bar, gear 6 bar, softsoap liquid hand soap refill 56 oz. 1 ct. Speed stick or lady speed stick twin pack. Dove 12.6 oz. or select stylers, Pantene 17.7 - 21.1 oz. TRESemme shampoo or conditioner 25-32 oz. Garnier whole blend shampoo or conditioner 12.5 oz. Get Muscle milk protein powder 1.93 lb. and 1oo calorie 1.65 lb. Regular and light 6 pack, 8 oz. bottles clear 4 pack. glucerna advanced 4 pack. 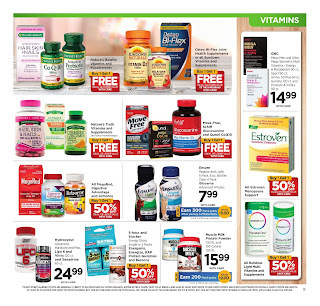 Mega men and ultra mega women's multi vitamins - energy & metabolism 90 ct., sport 90 ct., active 50 plus 60 ct., gummy 120 ct. and prostate&& Virility 90 ct.
See personal care products for more saving this week! Tampax Tampons 16-18 ct. or wipes 32 ct. 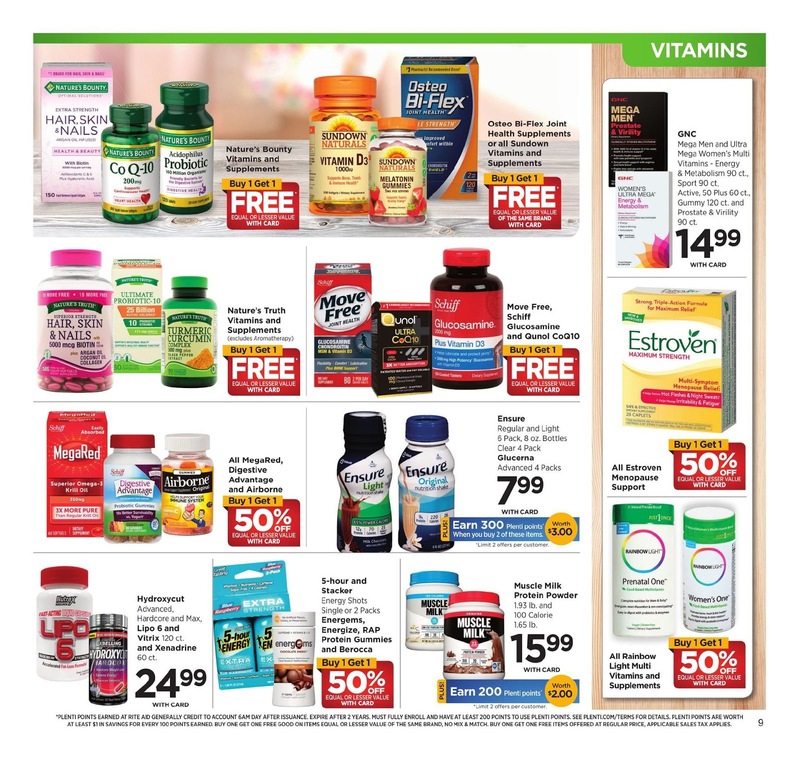 Advantage soy, infant, & toddler formula 21-25.75 oz. Always discreet 39-48 ct. pads 16-20 ct. 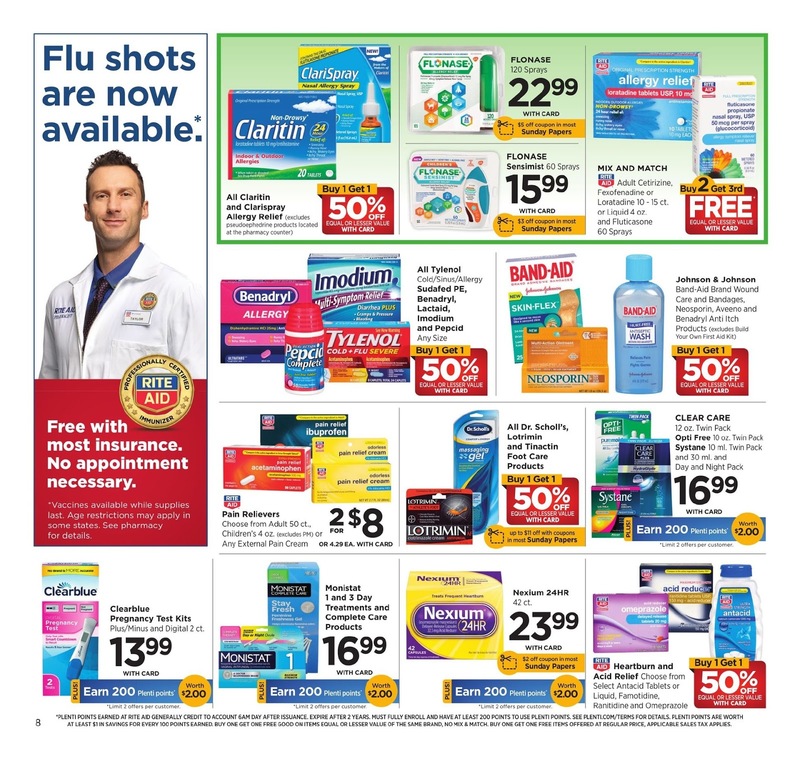 Always infinity or radiant 11-18 ct., maxi pads 14-22 ct. Pantiliners 34-60 ct. or wipes 32 ct. Protective underwear 12-20 ct., belted undergarments 30 ct. briefs 14 ct. or bladder control pads 30-54 ct. Edge or skintimare shave prep 7-10 oz. 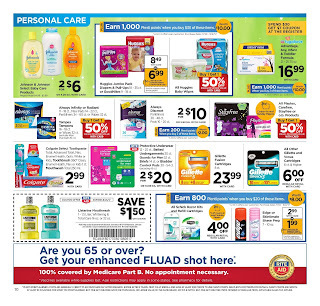 Also see Household essentials including Downy fabric softener dryer sheets 80 ct. or liquid 34 or 64 oz. Plates, bowl, cups. napkins, plastic cutlery or towelettes 40 ct. Paper towels 8 ct. bath tissue 1000 sheets, 12 ct. Charmin 4 pack bounty paper towels 2 pack or napkins 200 ct. Xtra laundry detergent 68.75-75 oz. Clorox bleach 64 oz., or scotchbrite sponge 3 pack, toilet bowl cleaner 24 oz. Greenworks liquid 32 oz. or clorox wipes 35 ct. Palmolive 20 oz. Tilex 16-32 oz. This Ad may contain time-sensitive information and offers. 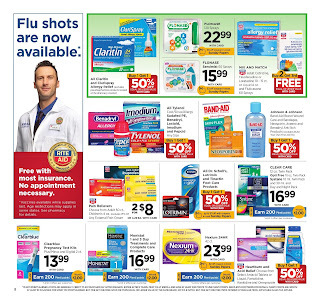 Always check this page for the new posts about the latest Rite Aid Weekly Ad & Deals.